Container System’s focus on assisting the customer achieve their goals and objectives has taken us into diverse industries and demanded partnering with numerous manufacturers and service providers. CSI does not look for the next big project. We look for how we can assist our clients achieve their next big goal or objective. CSI’s competence expands on a daily basis as customers seek to achieve new things. Manufacturers are not all created equal and they do not all do the same things well. Being married to the customer and not a product or manufacturer serves the customer best. Pallet rack manufacturers are a good example of manufacturing diversity. Some pallet rack manufacturers are exceptional with structural steel, some with roll form, some with racking systems for warehouses like drive-in racks, pallet flow rack, or a rack supported mezzanine. Pallet rack manufacturers, like all manufacturers and customers, have unique strengths. 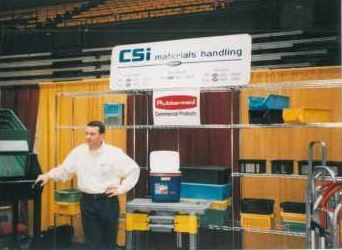 CSI works with Exceptional Clients and with Focused Manufacturers. Assisting customers in obtaining business results through the application of material handling equipment and concepts is not industry focused. However, all clients do have an industry family and many manufacturers have a primary industry focus. The reference table below displays a sample of some of our clients, their industry, and the primary manufacturers we utilized with a particular client as we sought to assist them in achieving their goals and objectives.